I've been creating my entire life and through the years I've made art in tiny rooms, on floors, in the yard, painted in the bathtub (when there was no room anywhere else to be messy), set up my studio in a guest room, a patio and a garage. 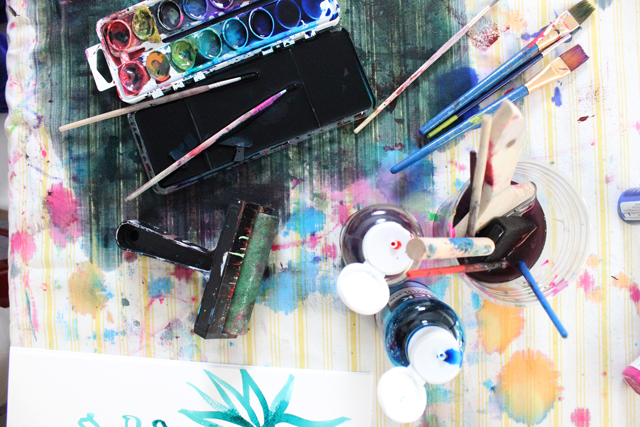 While a lot of my art making happens on the fly at home (often at the kitchen table), it is really important these days to have a larger space dedicated to my creative business and all the different projects that I juggle. 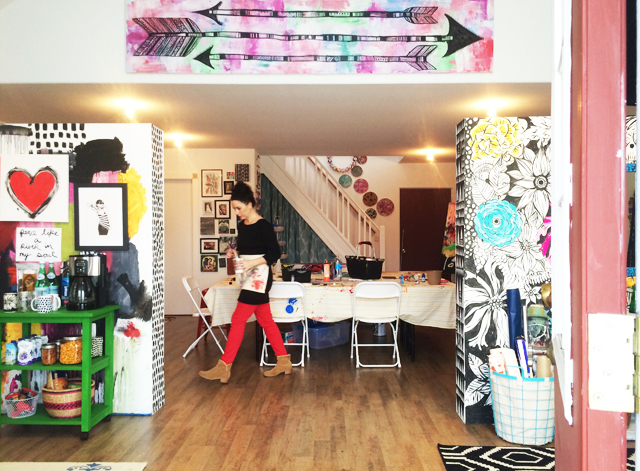 To kick off the new year here on the blog I thought it would be fun to share a tour of my studio space and a little insight into how I use the space. I rent a studio space that is about 5 minutes away from home and as much as it would make sense to have "regular work" hours at my studio, I do a lot of coming and going in small chunks of time- for some reason this works best with my creative process and our family life right now. When I am creating online classes I will spend hours filming at the studio, while other days I will create at home, drive up to the studio for some photography, paint a little, head back home, edit photos, hang with the family and then start another project. 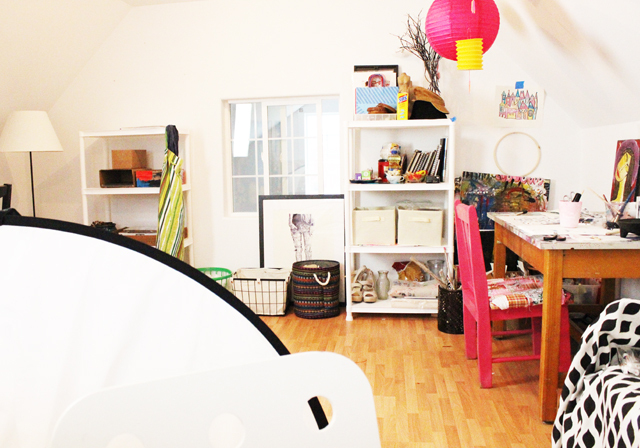 My studio space, more than anything is the place where I keep everything that I use for my creative business. 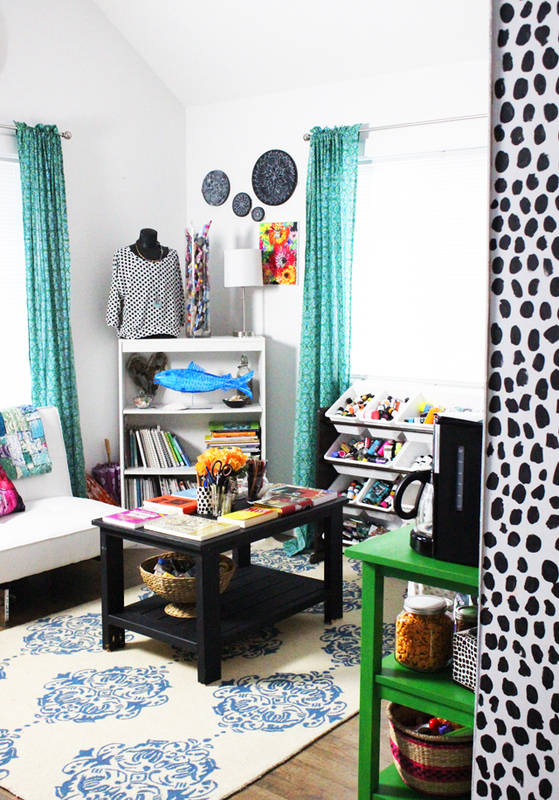 From a massive amount of art and craft supplies- to photography backdrops and lighting- to places that I film online classes and photograph projects- this space is "Alisa Burke's Crazy Creative Headquarters". 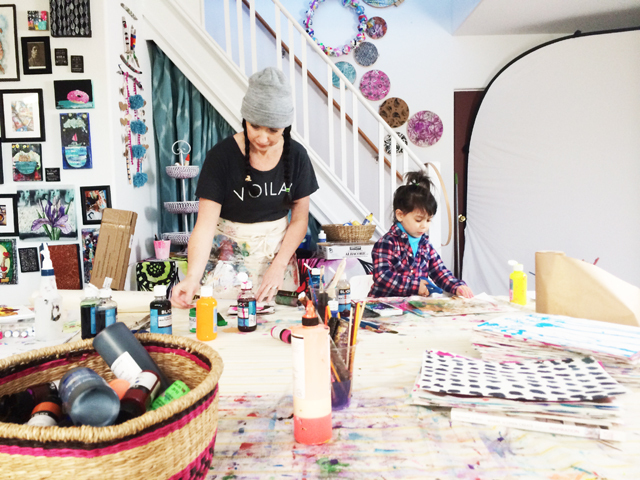 Since I juggle so many different projects, including offering live classes and retreats in my studio, the space is always changing, moving and evolving with all those projects. I spent my holiday break organizing my studio space to work a little better for some upcoming projects and right now (and I am sure it will change) I have the front half of my space set up with a couple of cozy lounging areas. While I do a lot of creating, I also spend a lot of time on the computer, drawing, brainstorming and editing videos so I like to have some areas that feel like a living room where I can sit and work. I recently added a snack cart because we all come and go from the studio and it never fails that someone (typically me or Lucy) gets hungry or thirsty once we arrive. 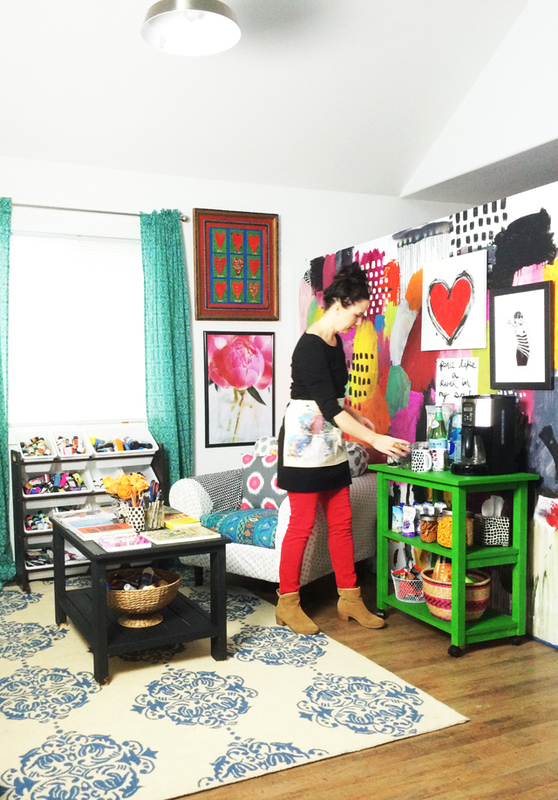 So instead of hauling our snacks back and forth, I painted a microwave cart and stocked it with out favorite goodies. This last year we added moveable walls to the studio (you can read about them HERE) and it has enabled me to set up different areas and spaces that I use for staging photos and dividing space. 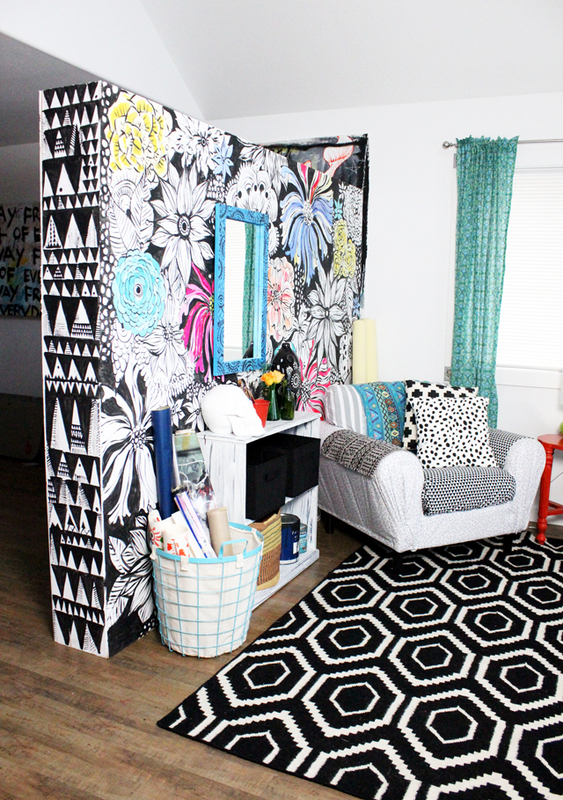 Since I love painting large and I love painting on walls, having these moveable walls has also enabled me to get really creative with painting murals and backdrops for all kinds of different projects! 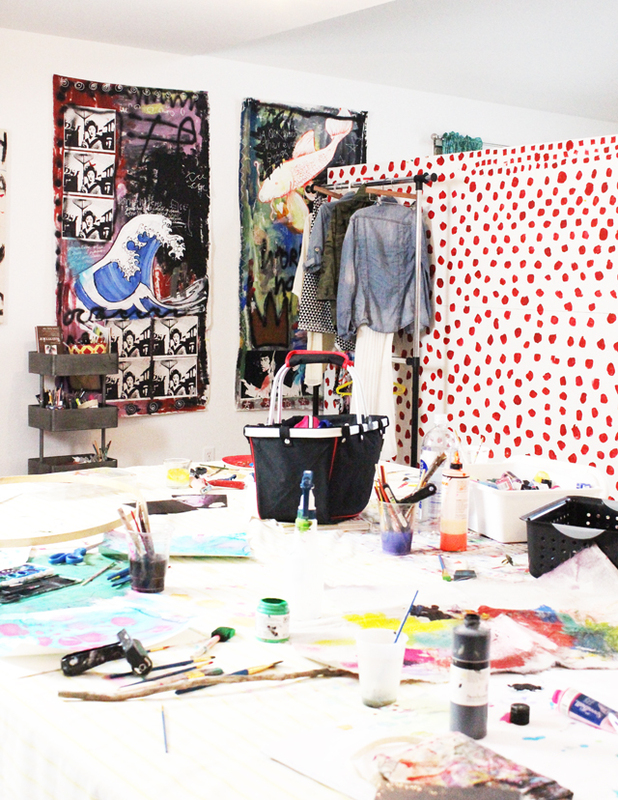 Behind my walls and the front portion of the studio, is where I do all my creating and it is where things get messy. My favorite way to work is on a large surface (I've pushed together 4 tables) to make one giant table. Typically this table it covered in all kinds of mess- paint, paper, canvas, trash, snacks...pretty much a little bit of everything. I thought I would clean the table for the sake of this post but that would be like lying to you! This table is never clean because I am constantly working and creating. It is also a perfect place for Lucy and I to work side by side on different projects. 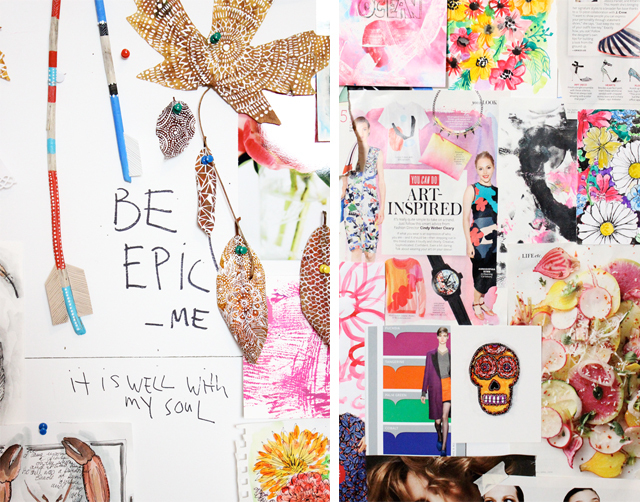 One side of my moveable wall is a place for inspiration. 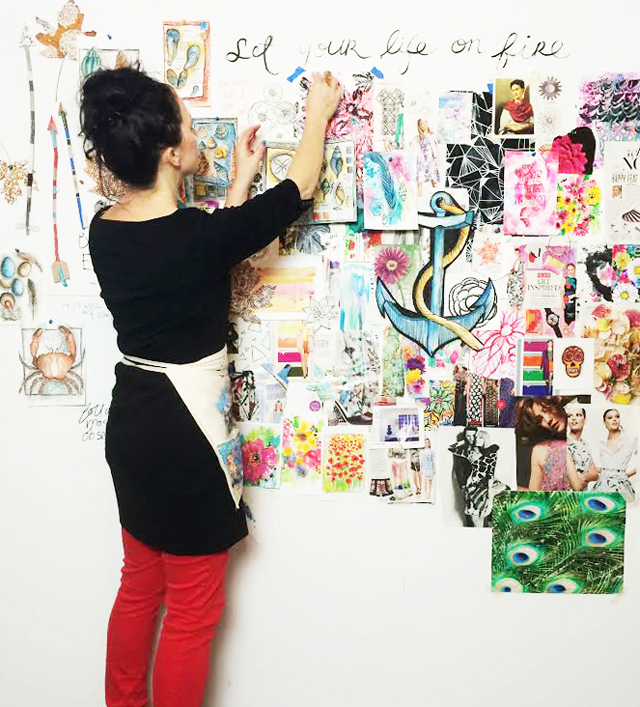 It has always been really important for my creative process to have an inspiration wall or place that I can slap things up that catch my eye- colors, images, pattern, photos, doodles, drawings, sketches and more keep me inspired. 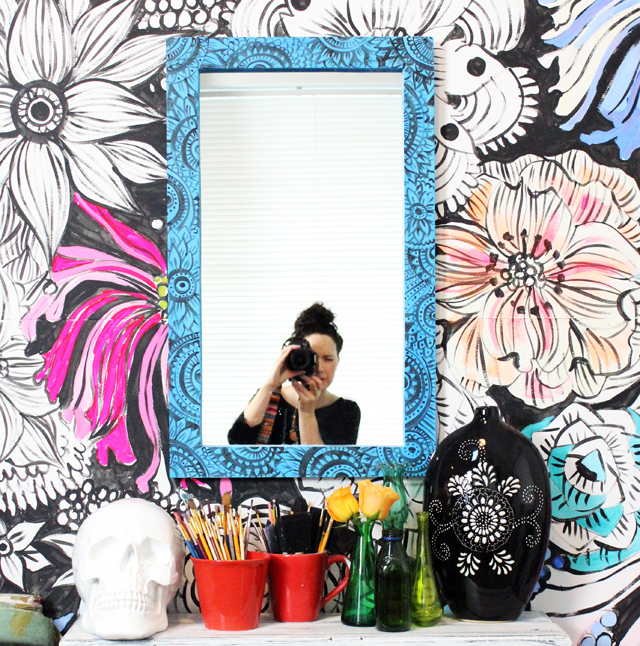 The backside of the other wall is a place that I use to paint over (and over and over again) with different colors and patterns. Often this is what I use as a photo backdrop for projects. I have a rolling rack to store clothing (often I change into my studio clothes), I also keep clothing on hand that I use for photo shoots and even use it as a place to hang fabric and canvas. 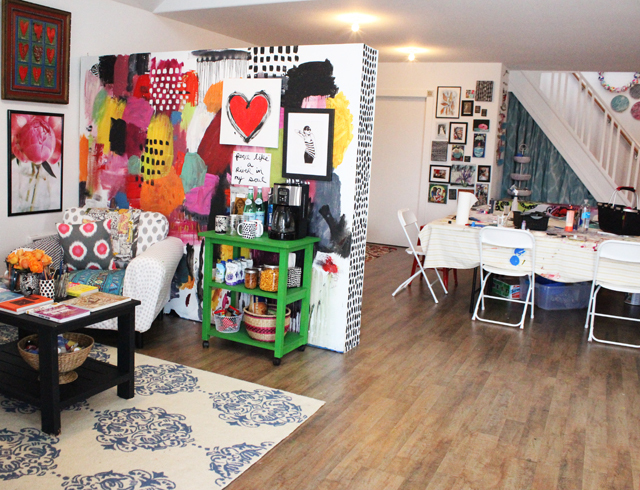 There is also a loft space upstairs that is currently an office space as well as a catch all for more supplies, products, files and boxes full of artwork and projects. 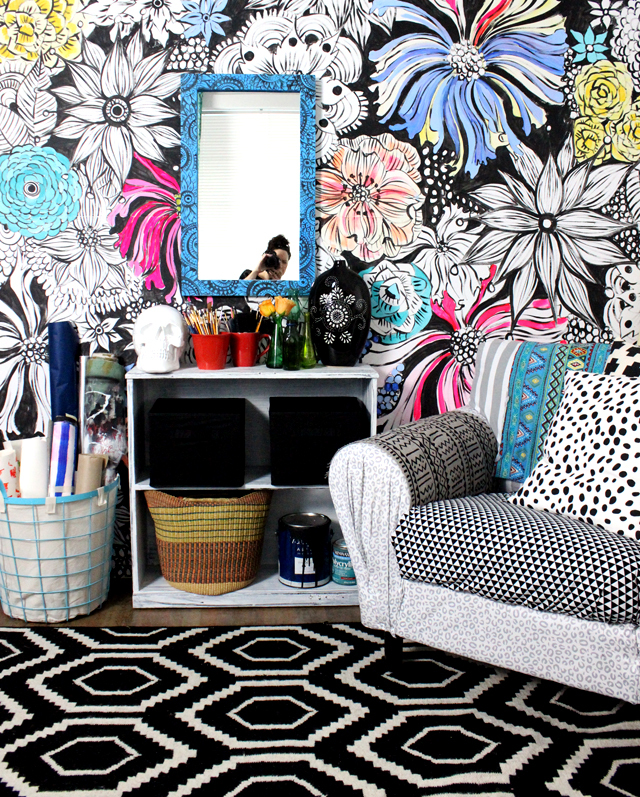 This space is rarely clean and organized and that is fine with me! 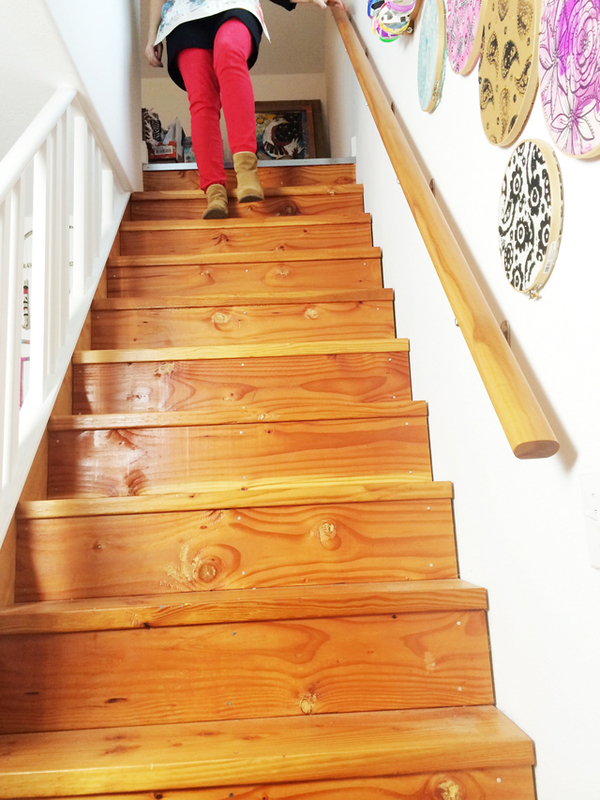 I really like having a place for storage where there is no pressure to decorate or even clean. 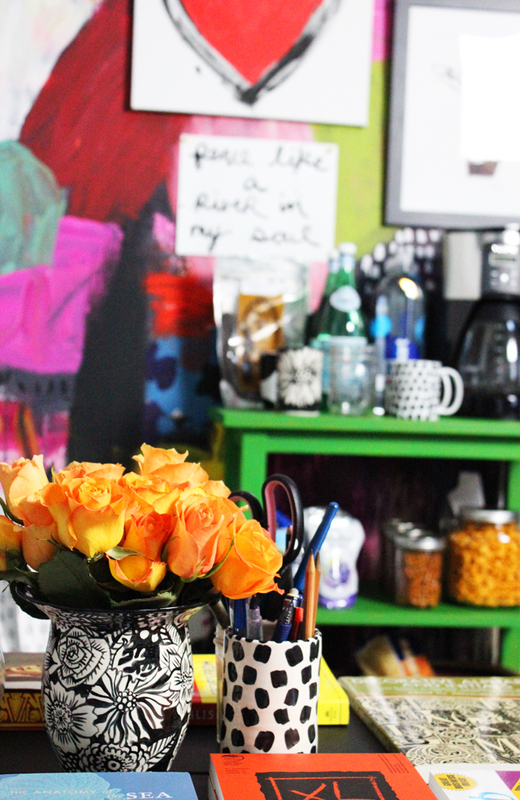 So there you have it- a little peek into my studio! 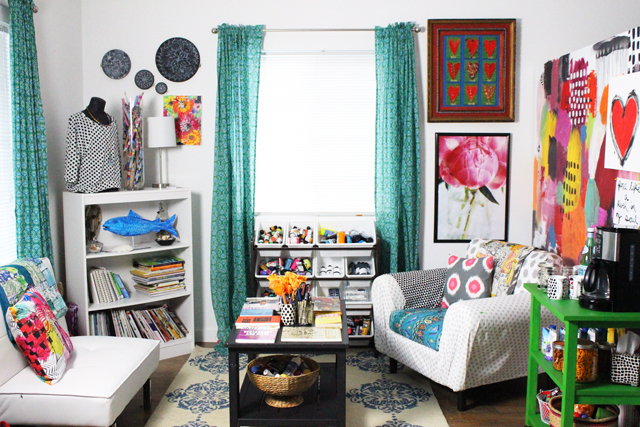 Your space looks so inviting and bright, and also so cohesive. 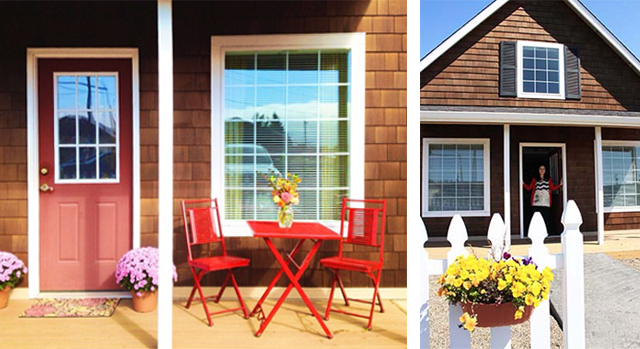 Your style shines through everything, from your art to the colors to the choice of furniture. I WISH I had a space like that! I like the black and white, a lot! Wow! Amazing! Creativity is from soul and from home! Great space: you've made it suit your needs....fab! 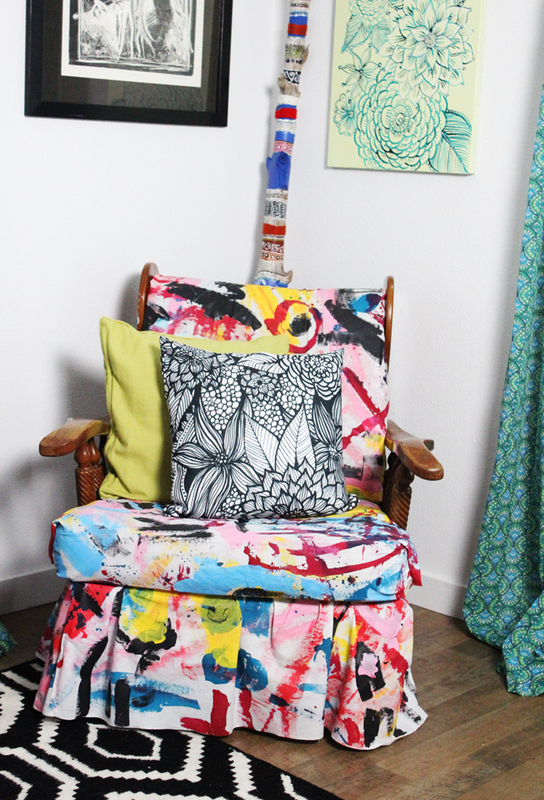 I still *love* that chair (the one with the painted fabric)...love it, love it, love it! You have done an amazing job with your studio. I know you are very proud of your accomplishments and so you should be. I have been following you through your quest and it looks like you have obtained the goals you have always wanted. Congratulations!!!!!!!! Talk about a dream studio! Thank U for the tour and the inspiration! Oh my heart is so full right now! What a beautiful, inspirational place!!!! You have created such a beautiful, inspiring studio. I think I could live there and never leave! Thank you for the tour!!! 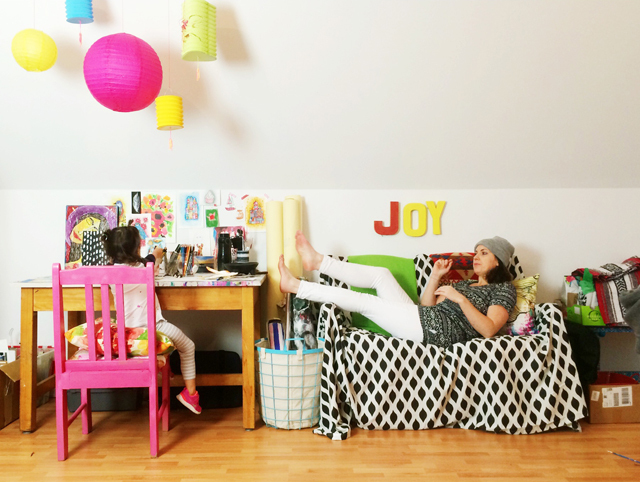 I love seeing how other people mesh life with their creative pursuits. I have a small space that I am making into a studio and this post has inspired me! 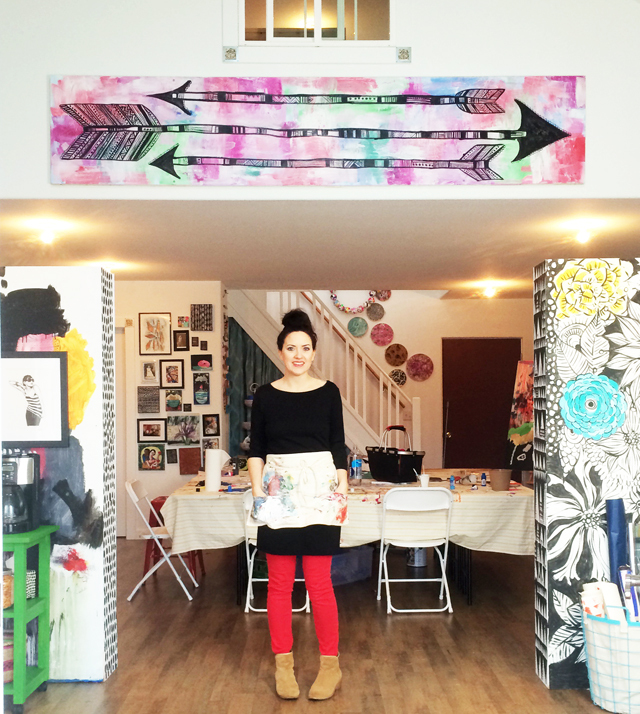 Your Art and Inspiration Radiates thru out your studio and it is amazing. I love all your creations. Thank you for sharing! You're so lucky to have so much space to spread out. It really is lovely! I thought I had a nice big space but nope, not like that. Tomorrow is the day I start re-organising my space. I need to buy shelves and have enough space for sewing, printmaking and painting ... If only I could have the whole space ... Half of it's been consumed by another member of the family which I totally wasn't planning on when getting it built. You've inspired me to take before and after shots now. Thank you for adding this when you did! My inspiration! 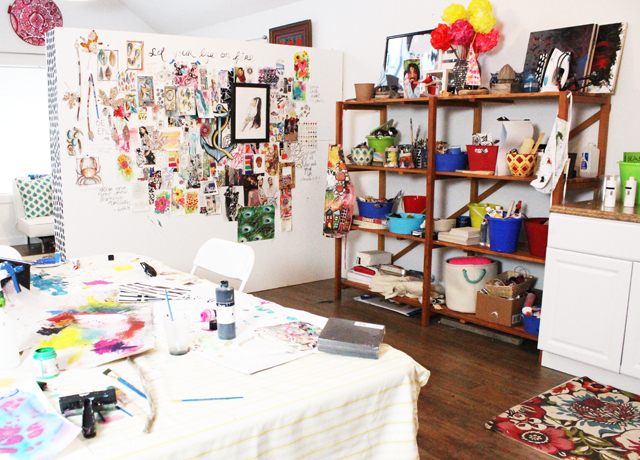 I love this walk through of your studio, those walls are my favorite thing ever of yours!! I keep thinking of how I can do that in my house, lol. We have nowhere to take pictures, wish I could pull out a wall just for a backdrop. 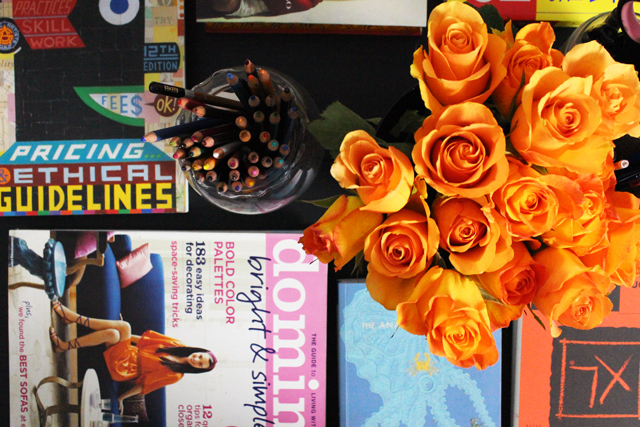 Love your set up and creative mess on the table, that is how mine is too. So happy you could find this place when you moved for your studio. I had a question: have you thought about having classes there for the community? Like women's night or even a kids craft day. I personally would love that if I lived in your town. I bet a lot of women there would love for you to start something like that. I used to have crops at my house and it was so much fun. What a wonderful place to work. Love it. What a colorful and creative place to do your work!! 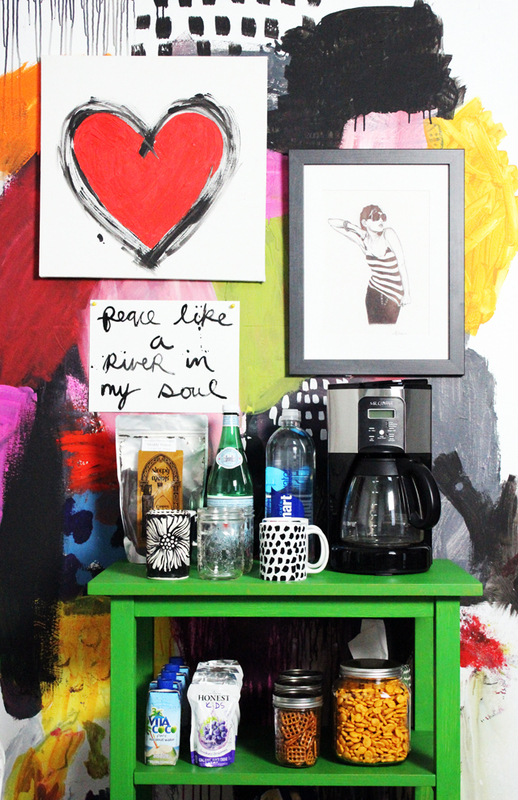 Love your floating walls and your bravery in painting them over and over. I loved your You, Me & the Sea wall so much and literally screamed, "NO!!!" when you painted over it but that shows your well of creativity - always full of ideas and willing to implement them. Thanks for the inspiration!